It can be a challenge to keep up with Mostafa Minawi. The peripatetic Cornell historian never lets the relative isolation of Ithaca define him, continually popping up for engagements or research stints in places across the globe. That’s not unlike Minawi’s work itself, which spans traditionally separate subdisciplines. Taking his chief specialty, the Ottoman Empire, out of the Middle East area studies prison to which it’s so often confined, he has traced, in detail, many of the long-missed connections between the Sublime Porte – the center of Ottoman governance – and sub-Saharan Africa. More specifically, his research has demonstrated how those links played into the Ottoman Empire’s participation in the late nineteenth century “scramble” for territory by European empires on the African continent – an episode in which, Minawi argues, the empire played a much more active role than has previously been assumed. Minawi’s first book, The Ottoman Scramble for Africa: Empire and Diplomacy in the Sahara and the Hijaz (Stanford University Press, 2016) documents some clear examples of this engagement. Its foil is, explicitly, historians who have seen a weak Ottoman empire take a backseat to European expansion during the fin-de-siècle. But his argument might be best understood through a series of images Minawi displayed during a talk given to Cornell’s Institute for Comparative Modernities this past December. In 1856, when the empire was formally welcomed into the European “family of nations,” its officials stood, individually recognizable, front and center in artwork representing the conclusion of the peace after the Crimean War. By the period of the 1884-85 Berlin Conference, famous for its role in the Scramble, the sole Ottoman official visible in depictions of the event is an almost anonymous background figure with his head buried in his hand. In the minds of European observers, the empire, its territory dramatically reduced in military contests with Russia, its treasury encumbered by burdensome debts, was clearly the proverbial “sick man,” destined to play little role in the races for territory that defined the late-nineteenth-century New Imperialism. 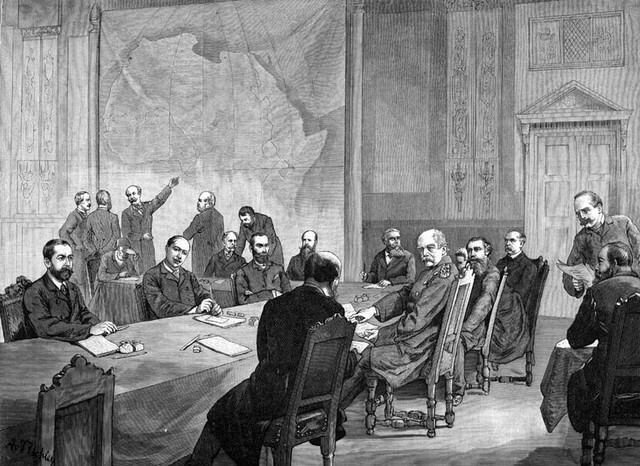 A representation of the 1884-85 Berlin Conference. The Ottoman representative, head in hand, is at rear in the center-left of the image. Yet the picture, Minawi contends, looked much different from Istanbul – and perhaps even more so from the African territories in which it sought to preserve and extend its influence. Trade routes from Ottoman Libya stretched across the Sahara to Central Africa’s Lake Chad basin, where the empire claimed influence over a number of kingdoms. In order to protect and solidify these bonds in the course of the Scramble, the empire solidified its alliance with the Sufi Sanusi order, which established lodges throughout what the Ottomans claimed as part of their African sphere of influence. The empire was not only a more central participant in the Berlin Conference than European art let on, but proved an expert wielder of the international legal terminology that developed in the course of the Scramble for the establishment of sovereignty over territory – building terms with legally specific connotations, such as the German Hinterland (territory in the interior empires which coastal territories were allowed to claim for themselves) directly into Ottoman Turkish, and appealing to the doctrine of “effective occupation” (essentially establishing a presence on the ground in claimed territories) by extending telegraph lines from the Libyan coast deep into the Ottoman Sahara. However skillfully demonstrated de jure, however, Ottoman claims in Africa were less respected in fact. European powers concluded secret agreements allotting Ottoman territories to their own dominions regardless of the artfulness of the legal arguments emanating from the Porte, the empire’s efforts to fulfill the requirements for colonial occupation, or Istanbul’s acumen at determining whether Europeans were acting in bad faith. For Minawi, all this is important and yet somewhat beside the point. Redefining the Ottoman Empire as an active participant in the Scramble demonstrates that its potency persisted even as late as the period just before the empire’s dismemberment after the First World War. It also forces us to rethink teleological assumptions about the inevitability of Ottoman downfall that seem to follow so easily from European accounts that missed the empire’s efforts in Africa or failed to take them seriously. In November, I managed to catch Minawi when he was between trips to New Mexico and Sudan. Our conversation, edited for length and clarity below, ranges from his recent talks to politics in contemporary Turkey to his unusual progression from engineer to consultant to historian to why the Ottoman Empire can only be studied outside a paradigm that seeks to box it into traditional area studies categories, the relationship between history and current events, and his next project, which follows up on his first book to look at how the Ottoman Empire engaged in the process of making claims in another part of the continent: the Horn of Africa.